By the late 1800’s, early 1900’s, with a growing country hungry for professional and exciting entertainment, county and state fairs, wild west shows, traveling shows of all kinds was the rage. Likely inspired by the Columbian Exposition of 1893, which was designed by our own Frederick Law Olmsted, names like Buffalo Bill, Ringling Brothers, Annie Oakley, etc. answered the call. Especially from the New England to mid western states, the summers were full of these traveling shows playing to packed houses. At the same time, just after the Civil War another sport was being introduced to America, harness racing. Being primarily a farming nation at the time and powered mostly by animals, especially horses, many farmers began to gather on weekends to race their horses against their neighbor’s horses, the same horses they plowed the fields with during the week. Over time, this “friendly competition” developed into a sophisticated and big time sport called “harness racing”. The main venues in those early days went along with the state fairs and the purses for the winners began to grow as well. By the early 1900’s harness racing was becoming a big business, again, primarily from the mid west into New England. It was also decided that all harness race horses, regardless of what month they were born in would have January 1st as their birthday. 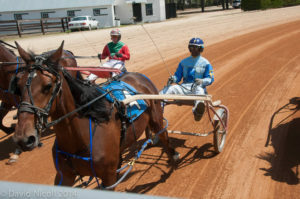 As a result the most financially lucrative racing became, and remains today, the racing among 2 and 3 year old horses, whether they be the trotting or the pacing gaits. Leonard Tufts, son of the founder, always alert for new attractions for his Pinehurst guests, saw the dynamics of fairs and harness racing and in 1915 decided to build a permanent venue on just over 100 acres at the edge of his village. He built 2 race tracks, one a half mile inside of one 5/8 in distance, and, beside the tracks he built a grandstand, a “fair barn” to hold events, and some stables to house the horses. He held multiple types of events inside the centerfield of the tracks. In short, he could hold events throughout his season for his guests and could attract horse owners to stable their horses throughout the winters as they became race horses, and, these owners could jump on the train and visit Pinehurst to check on their horses, enjoy golf and all the other activities being offered. The Fair Barn was damaged in 1932, and was turned into another stable for the race horses. Then in the mid 1990’s a group of wonderful local Pinehurst people got together and restored the Fair barn to an event complex greater than its best days of glory. And, today, the Pinehurst tracks are among the finest training centers in the US, housing up to 400 horses from October through early spring. 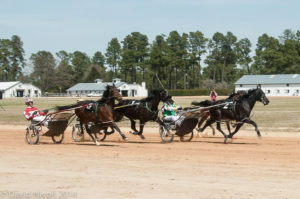 The highlight of the year is the annual “Matinee Races” in early April where the young horses get to show off their hard work all winter in front of 1,000’s of spectators tailgating alongside the track.